If there is any other name more synonymous with professional grade, American workmanship than Craftsman, we haven’t found it, and to be quite frank, we’re not interested. While yes, there are other brands, some that make even better materials than even craftsman, especially in the more niche markets, no one does it more consistently well across the board. Craftsman is the ultimate jacks of all trades when it comes to tools. Which is what makes them perfect for a list like this. We start off this list on the best foot possible, with a classic set of 17 Craftsman screwdrivers. 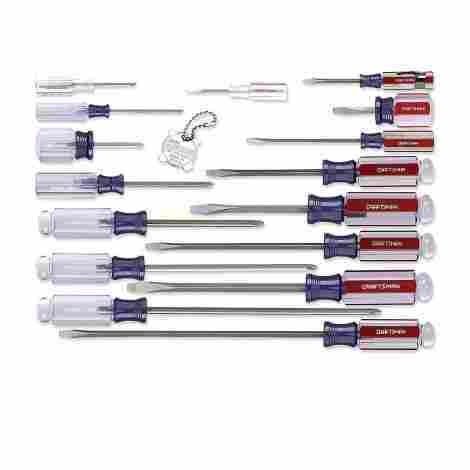 Everyone needs some good screwdrivers in his or her toolbox, and this set will have you as covered as you can possibly be. Just make sure you have a place to put them, as this set does not come with its own box. If you aren’t screwing things in for a living, you likely don’t need as many types of screwdrivers as those of a more professional persuasion. In which case, this probably has every length of screwdriver you could possibly need. If you need another type of screwdriver after getting your hands on these, then we’d be awfully surprised. There are two types of screwdriver, for those not already in the know. There are Philips heads and flatheads. Both refer to the point of the driver, and what shape it takes on, and thus what kinds of screw it can interface with. This set reaches its max number of 17 by including both kinds in equal measure. Obviously, it costs a little bit above average when you include such a large number of tools in the same set. But thankfully this is nowhere near the most expensive thing we’re going to see on this list. 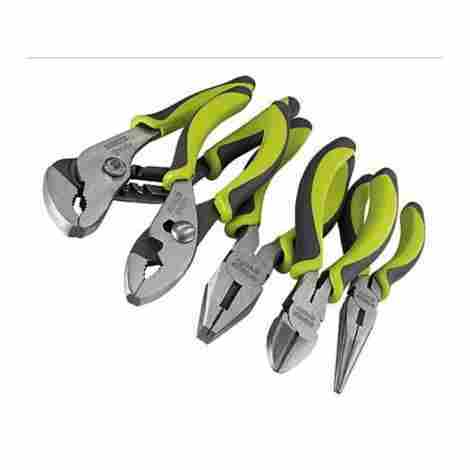 Coming in second place is the Craftsman Evolv 5 Piece Pliers Set. The Craftsman Evolv series has garnered quite the reputation for turning in excellent products, more than living up to the hype its name implies. And nowhere is that more exemplified than with the Craftsman Evolv Pliers. There’s no grip quite like the Craftsman Evolv’s grip. Ergonomically designed to perfectly hit the human hand when held, these grips will feel utterly natural as you use them. Perfect for when your hand is cramping or experiencing aches and pains, and you don’t want to deal with an uncooperative grip. This may not seem like much, but if you’ve ever had to look for one specific tool that you know you left on your work desk, then you know how important it is that a tool be as easy to spot in a crowd as possible. Which is why this set of pliers have bright green coloring for their grips, easy to spot no matter how much clutter is in the way. Since there are only five items in this list instead of 17, the price for this one is, of course, much lower than the previous set. You’ll rarely end up paying all that much for this batch of hand tools. Sometimes a normal wrench just isn’t going to cut it. These are rare moments, however, which is likely why a lot of you have probably not heard of a strap wrench. But rest assured, the Craftsman 2 Piece 16 Inch Rubber Strap Wrench Set is the perfect alternative when the normal wrenches just won’t cut it. Obviously when the rubber straps being used to make these wrenches are the main selling point, those straps better be strong. Otherwise you’re in for a lot of frustration. Luckily, these straps are made from some of the highest quality rubber on the market, offering high-quality service and strength. These are a rather unorthodox means of working a wrench, and they’re a method that requires a strong, consistently tight grip to work properly. Which is why the handles, while not made with the same strength as the straps themselves, are tough and comfortable enough to hold for long periods of time. These are the cheapest items we’ve showcased so far on this list, with only two, fairly simple devices up for sale, so of course, the price is very reasonable. Coming in at #4, we have the Craftsman 20 Piece Ratcheting Wrench Set. There isn’t much to say here, wrenches and ratchets are rather simple, rudimentary devices that are kept in ubiquity for their versatile usefulness. What do we mean by this? Let’s look closer and discuss. Would you trust a ratcheting wrench if it was made of anything else? Stainless steel is the perfect material to make these tools out of, because it almost never rusts, lasts pretty much forever, and is the toughest metal on the commercial market. Perfect for your ratcheting wrench set. One thing that annoys people who use manual ratchets is the process of having to turn and lift and turn and lift and on and on for what feels like forever. 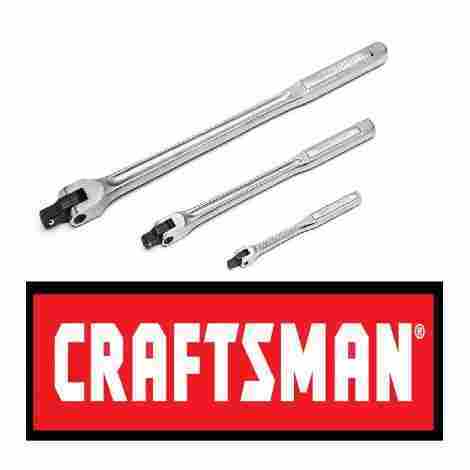 However, Craftsman ratchets require no such busywork, being equipped with a box end to their ratchets which not only removed the need for lift but also gives your knuckles plenty of room with which to clamp down on the ratchet. From the cheapest entry thus far to the priciest. While not the most expensive thing on this list, it still more than outweighs the previous entry. In the centerpiece of our list, we have our #5 pick, the 19 Piece Universal Max Axess Drive Socket, and Ratchet Set. Quite a mouthful, isn’t it? But regardless of its word salad name, this toolset is one of the best sets that the brand has in their arsenal. Now, let’s take a look and find out why. The ratchet used for this set is designed in a way known as a “pass thru” ratchet. This means a number of different things, but the one we’re focusing on here is that it means that this ratchet is up to 40% stronger than most traditional ratchet builds. That black paint job is much more than a simple fashion statement. The paint is actually known as oxide, a type of coating that helps to prevent rusting, while also helping reduce friction against hard surfaces with the aid of its smooth polished surface. Unlike other sets on this list, including those we’ve seen so far, the 19 pieces on this list are not different ratchets, but instead a single ratchet and 18 different sockets. So, the price is not as high as you would think it would be. However, it is still moderately expensive, so be aware of that. In the #6 slot, we have another mouthful, with the 8 Piece Metric 12 Point Combination Wrench Set. Not the most creative of names, we agree, but an apt title nonetheless, for one of the brand's best deals yet. 8 of their finest wrenches for a very modest sum. Let’s see what else you’d be getting out of this bargain. 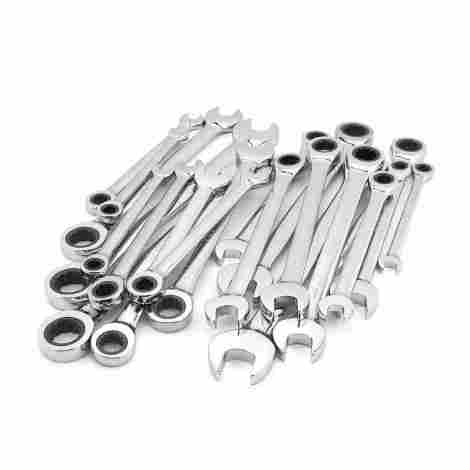 This wrench set comes with 8 wrenches, which you would think would make the selection limited, but thankfully the sizes are so varied and yet so specialized for different scenarios, that most of the time these 8 will be all that you need. It’s especially good for the ratchet ends, as when you have this collection, you can just grab a different wrench instead of having to change out sockets. Got a lug nut or bolt that you need to get out, but it’s stuck in a super tight space that your other wrenches can’t reach? 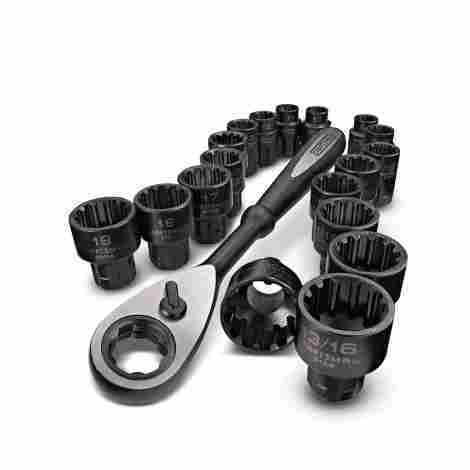 Well, worry no more, because this set of wrenches are equipped with the 12-point box end design, which makes these wrenches much thinner for those tight spaces, without sacrificing any of the power. The best part about this set, though, is the price, which is one of the best deals you can find for a product like this. 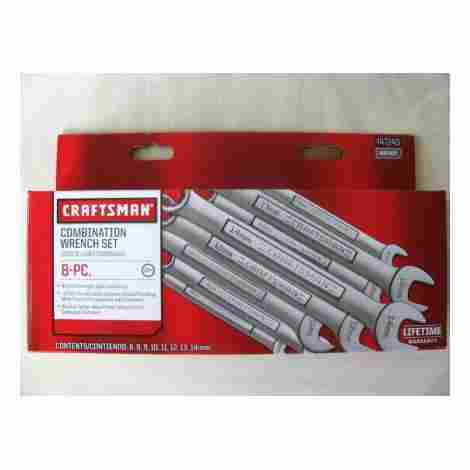 You can have a set of 8 of Craftsman’s finest wrenches, and all for, on average, less than $20. 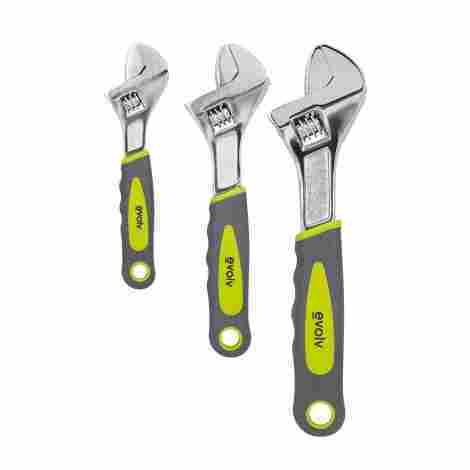 At #7, we have the 3 Piece Adjustable Hand Wrench Set. When it comes to simple hand tools, the only thing simpler than an adjustable wrench is a hammer, since it doesn’t have nor require any kind of adjustment. 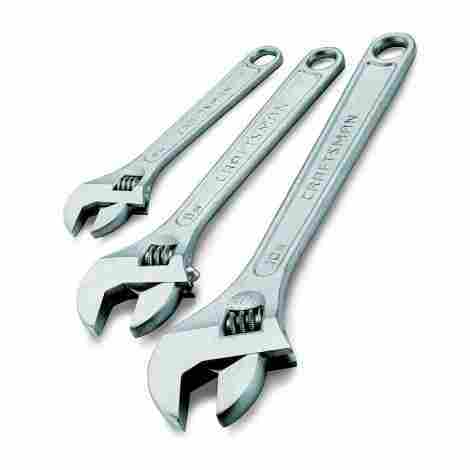 But we’re not here to talk about hammers, we’re here to talk about this excellent set of wrenches. Every hand tool needs to have some kind of countermeasure against having to be used in a tight space, in order to make things easier, or at least more efficient, for the user. Wrenches have the tapered head design, which makes it easier to move the wrench head around in tight areas. When you hold a wrench from this company, and really any high-quality wrench worth buying, you may notice a tiny bit of roughness to the texture. Nothing too bad or anything that puts you in danger of harm, but it’s noticeable. This is a special coating that makes the metal used to make these wrenches almost completely resistant to rain, abrasion, rust, and wear. You wouldn’t think three little wrenches would be all that expensive, and you would be very very wrong. In fact, this set of wrenches is one of the priciest entries on this entire list. However, it being a craftsman wrench set, you will get your money’s worth. Kicking off our final 3 entries, we have the 3 Piece Flex Handle Breaker Bar. Got a really stubborn fastener stuck somewhere, and nothing else is getting it out? A breaker bar is exactly what you need to get that thing out. So what else does this set have to offer? Let’s find out. Of course, some bolts need a bit more to get them out than a normal breaker bar can dish out. This is where the Craftsman variety comes into play, with its trademarked flex handle. This handle seems normal until you actually start using it and feel the amount of control and flexibility it gives you, which can make all the difference in the world. Not only are these breaker bars made with the same high-quality steel that comprises all of this brand's hand tools, but it’s also coated in the same weather and abrasion resistant coating that makes up the previous entry as well. Since you’re getting three very high-quality breaker bars, it makes sense that the price would be reasonably high. However, the price isn’t all that high, all things considered, so you should be fine. In our second to last place entry, we have the Evolv 3 Piece Adjustable Wrench Set at #9. Our last piece from the Evolv lineup, and a very good one at that. The Evolv wrenches outclass the normal variety of Craftsman wrenches in almost every way but length, as the longest piece of this set can’t hold a candle to the longest piece in the last adjustable wrench set we covered. However, don’t think that’s the only feature it has. You’re probably wondering what exactly a knurl is. A knurl is the little turn-y thing at the center of the head that moves the claws of the wrench back and forth. It’s incredibly important that this thing be as easy to turn as it possibly can be so that you can get the claws into the exact right position. Fortunately, the knurls on the Evolv wrenches are extremely smooth and easy to turn. The grips on the Evolv line are easily the biggest selling points of these tools. 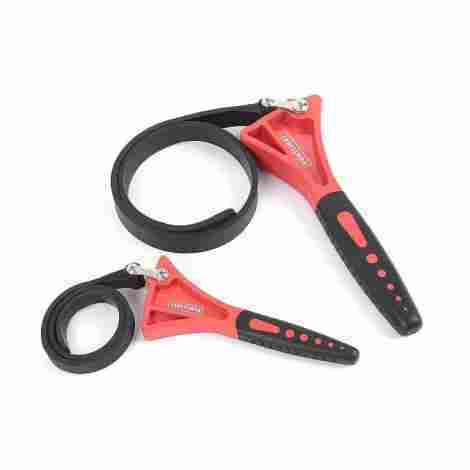 Not everyone has a good pair of gloves just lying around when they work with a hard metal wrench, so these wrenches are coming with a handy, comfortable rubber grip is a great point in their favor. In stark contrast to the previous entry about wrenches on this list, this set of wrenches is very reasonably priced. It shouldn’t cost you all that much to get your hands on this premium set of adjustable wrenches. 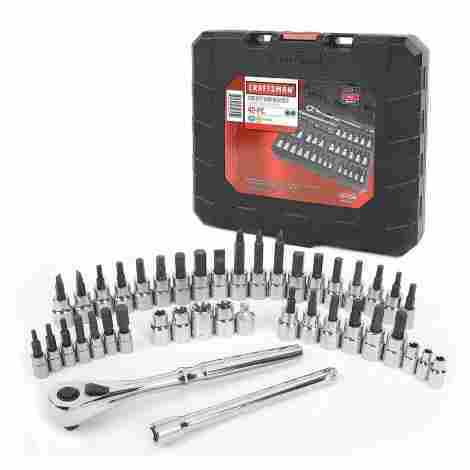 For our final entry, we’re showing off the 42 Piece Hex and Torx Socket Wrench Set. Like with our previous ratchet set, this isn’t so much a set of ratchets as much as it’s a single ratchet with 41 sockets. And with that said, let’s get into the biggest point in this ratchet’s favor. Literally, every single one. There’re over 40 sockets here, it will be a cold day in hell before you’re at a loss for what socket to use. And since every single one of these, including the ratchet they come with, all comes bundled in a sturdy, specially made toolbox, you’ll never wonder where they went. There are few things more annoying to a handyman than a stripped socket. It basically means that, no matter how useful that socket is, or how much you needed it at that moment, it’s basically useless. However, the sockets and driver heads of this ratchet and socket set have been so precisely cut that there is practically no risk of stripping at all. Obviously, all of this equipment, and then you throw in the box on top of that, and of course you have a rather expensive product. However, you needn’t worry, as this is nowhere near as expensive as you’d think it would be. As we’ve shown throughout this article, Craftsman may be a jack of all trades pretty much everywhere else, but when it comes to simple hand tools, they run circles around the competition. No one does it better, faster, stronger, or whatever else you could think up than Craftsman. A lot of this has to do with the durability of the tools, and the materials used to make them, as there really is no competition there. But that’s for the criteria segment to expand upon. For now, we just want to clarify a few things before we move on. Craftsman may not be the absolute best at power tools. They may not be the best at worker wear. They may not be the very best like no one ever was at any of those things, but when it comes to simple, effective, important hand tools like hammers, screwdrivers, and ratchets, they’ve got everyone else beat. Their tools feel so much better, work so much more efficiently, and just offer a much better experience than anyone else on the market. So, if that’s what you’re looking for, if you refuse to settle for anything less than the best, then you need to find a Craftsman. It may seem odd having an extensive list of criteria for evaluation over simple hand tools. And indeed, a lot of this was bone simple, since hand tools don’t give us a lot to work with in terms of varying criteria. However, we persevered, and we like to think we came up with a list that really helped us narrow down candidates until we had our ten contenders. With that said, here are those criteria now. It makes sense to start here since, with a lot of entries, this is where things ended as well. A lot of tools really do just boil down to how well they can hold up under physical scrutiny. For instance, if a hammer broke on the first swing, you’d feel ripped off, wouldn’t you? Because that’s all any of us ask out of a hammer, isn’t it? The durability of a tool boils down to the materials used to make them. When it comes to Craftsman, the most commonly used items are either high-grade plastic or stainless steel. Sometimes the two will combine, such is the case with the Evolv series and their high-grade plastic and foam grips to keep your hand comfortable, and thus energized, while you work. Speaking of which. When you’re using a tool, you’re probably holding onto that thing rather tightly, aren’t you? It’s the same instinct that makes us push the button harder when playing video games, a strange belief that doing something physically harder will somehow make it work more. It’s pure instinct and hard to train out, and even beyond that, you are going to have to hold onto a lot of these tools rather tightly. As you can imagine, this can do absolutely zero favors for your fingers and palm, especially over long periods of time. Which is why, when we assembled this list, we looked for tools that took measures to make it more comfortable to hold them for long periods of time. There are many different ways to go about doing this, but the most popular by far tend to be making a rubber and plastic grip around the base of the tool. Then making that grip as comfortable to use as possible. This can be achieved either by molding the grip to be more comfortable with your hand or just making the materials used to construct the grip more comfortable. And then you get into more complex matters, like knuckle space. If you’re going to hold onto something like a hand tool, then you need as much space for your knuckles to lock down on the tool as you can get. This boils down to the handle giving you enough space to grab onto, and this can vary from person to person, so this was especially tricky to figure out. Durability: Well, of course, right? The best way for something to last a long time is to make sure it can take some punishment. Elemental resistance: Standing up to physical scrutiny is one thing, but what about the weather? We’re talking about rain, dirt, snow, all the things that get into the gears and knurls of your tools and gunk up the entire system. We’ll discuss this later. Compactness: What does this have to do with anything? Simple, one of the reasons that you need to put tools in a toolbox, besides being able to find them, is that toolboxes keep the majority of the elements off of your tools. As such, one of the biggest factors of whether or not your hand tool will last you a long time is whether or not the thing can actually fit into one of your toolboxes. There are other factors, of course, but those are the three most important that we considered. You might have picked up on this, but this list was primarily composed of sets of tools rather than individual items. We did this mostly because sets are a lot more interesting to talk about than individual hand tools. It’s easier to come up with paragraphs of information about ratchet and 41 sockets than for a single ratchet and zero sockets. With that said, we decided to instead base our criteria on the quality of that set. For example, whether or not it came in a box was a big part of the evaluation, only countered if the box it came in was of poor quality. Secondly, we judged how thorough the set was. If the set didn’t include everything, or at least most of, what you could possibly need, whether it be sockets, or screwdrivers, or whatever else, then its consideration went down a few pegs. If you’re going to buy a tool set, it stands to reason that you would be paying so much of that money for something that’s going to give you everything you need to get started. Price was a lot easier to manage this time around than we initially believed it would be. With sets this big, it’s easy to assume that they’re going to cost you a pretty penny, but in truth, they’re actually quite affordable all across the board. None of them went anywhere near the triple-digit mark, making it a lot easier to justify the price with their content. And that’s ultimately what we were looking for with these entries. Not the cheapest, but the ones that most justified their price tags with excellent content. Because even if they cost a whole bunch, if you’re getting what you pay for, then it all evens out and is still a tempting offer. For our final segment, we’re looking at FAQ’s. Again, it seems odd that there would be any commonly asked questions about such simple devices. The great thing about these sorts of hand tools is that they’re pretty much completely idiot proof, requiring no training manual, no long setups, just pick them up and start using them. However, even with the simplest machines, there are questions and concerns when it comes to Craftsman hand tools. Here are the most important we picked out, as well as the answers that come with them. Q: How can you make a business off of selling hand tools if they’re built to last? Isn’t that like making a company off of building ladders? A: Well, for one, in this day and age, no one is just making hand tools for his or her business. Especially a big leaguer like Craftsman. And the reason is exactly what you just said, it’s like building a company off of primarily building ladders. When your business model is based around items that need to be built to last, then any success is unsustainable. Which is why Craftsman branched out into other areas where they could. That way, they could sustain their business with items such as power tools or worker wear, while still keeping their build to the last standard of quality with their hand tools. Q: Why are there so many sets of tools on this list? A: The reason for this is simple: Because it’s more interesting. Really, that’s it. It is far more interesting to write paragraphs upon paragraphs of information about a set of tools and accessories instead of just a single hammer or wrench. Nothing much else besides that, really, it was just more interesting to write about a set than a single piece. Q: What’s the difference between a hand tool and a power tool? And I don’t mean big table saws, I mean things like power drills and impact drivers. What separates them from this list? A: Power tools are an expansive, fascinating topic that, frankly, deserves their own list in and of itself. However, the main thing that separated them was the fact that power tools are powered by electricity, whereas our criteria for a hand tool, in this case, was a tool that was as low-tech as possible, able to be picked up and used immediately without the aid of some battery. Q: What does it mean to be resistant to the elements and how do hand tools achieve this? A: This can refer to a wide variety of methods, but all with the same idea; to prevent rust, abrasions, or wear and tear caused by outside forces. And there are a number of different ways to do this, from being included with its own toolbox to keep the rain off of it, to applying special coatings during the manufacturing process that helps the metal’s resistance to rainwater and other elemental forces. Elemental resistance is one of the most vital cornerstones of achieving longevity for a hand tool. The outside world will be, by far, the worst enemy to your tools, rusting and damaging it as it’s exposed more and more to it. Now yes, it is up to you to take good care of your tools because no elemental resistance measure is perfect. However, you’re only human, so in case you slip up somewhere, there are plenty of ways for these tools to stay safe in volatile conditions.